Three-quarters of Americans are falling far short when it comes to exercise, and the South and Midwest bear the dubious distinction of having the most couch potatoes, a new government report shows. Only about one in four adults (23 percent) meets minimum federal guidelines for physical activity, according to researchers from the U.S. National Center for Health Statistics. But he suggested that it’s never too late for those who aren’t active. In the study, investigators Debra Blackwell and Tainya Clarke surveyed exercise habits among more than 155,000 American men and women, aged 18 to 64, between 2010 and 2015. The goal was to see whether Americans were meeting the most recent recommendations issued by the U.S. Department of Health and Human Services (HHS) back in 2008. Activities performed during work or while commuting were not included. The 2008 guidelines advocate muscle training at least twice weekly, alongside either 150 minutes per week of moderate-intensity aerobic exercise or 75 minutes of high-intensity aerobics (or a mix of both). The 23 percent figure shifted little throughout the five-year study, the investigators found. And the good news is that while three-quarters of Americans didn’t meet the thresholds, the 23 percent who did exceeded the federal goal of getting 20 percent adherence by 2020. The bad news, however, is that the report also found huge geographical disparities, with activity levels in some states dipping far below or far above the national average. “Fourteen states and the District of Columbia had significantly higher percentages of adults meeting the guidelines than the national average, while 13 states had percentages that were significantly below the national average,” Blackwell said. Among men, Washington, D.C., topped the rankings, with just over 40 percent of residents meeting the guidelines. But in South Dakota, less than 18 percent of male residents made the exercise grade. Colorado came out on top among women, said Blackwell, with nearly one-third meeting the guidelines. By contrast, Mississippi came in dead last, with only about one in 10 women achieving minimum standards. As to what might explain regional differences, Blackwell said “there are likely many factors that play a role,” including social and cultural backgrounds, economic status and job status. Blackwell and Clarke found that states that were home to more professional or managerial workers met higher exercise thresholds. Similarly, states that had fewer unemployed adults encumbered by fair-to-poor health or disabilities also registered higher exercise rates. But sedentary people who get off the couch and start moving actually have “the most gain in health benefit for any group of people,” noted Roberts, a professor in the department of family medicine and community health at the University of Minnesota. So what’s an aspiring exerciser to do? The findings were reported in the June 28 issue of the National Health Statistics Reports. 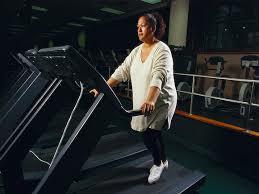 The U.S. Department of Health and Human Services has more about the exercise guidelines.